An early board meeting with some of the founders of the organization. 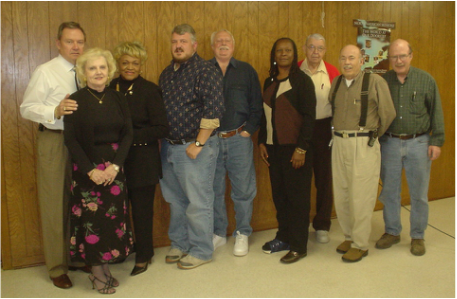 The Hillcrest Cemetery Memorial Association (HCMA) was founded in 2001 to combine the resources of various groups and individuals who were working to preserve and maintain Hillcrest Cemetery. Nearly all labor except routine mowing has been performed by volunteers. Maintenance mowing is performed by contractors paid from funds donated to HCMA, mostly from families. We do not make any business income from cemetery operations. We have no paid employees and board members are not compensated for their service. The purpose of this organization is to maintain and preserve the historically significant abandoned property known as the Hillcrest Cemetery located in East Point, Georgia. The Association will provide educational information and tours on the historical significance of Hillcrest Cemetery. Further this organization will maintain and preserve to the greatest extent possible the grounds, headstones, and natural vegetation associated with Hillcrest Cemetery. Originally, our board members were elected each February and met quarterly and as needed. It included former East Point elected officials, family members of those interred at Hillcrest, lot owners at Hillcrest, community improvement activists and concerned citizens. In recent years, board meetings have been paused due to several board members moving from the immediate area, as well as health issues of some members and the deaths of others. The remaining active board members meet by phone as needed today. In the near future we plan to rebuild the organization by re-establishing an active board. Hillcrest Cemetery Memorial Association is a 501(c)(13)* non-profit organization, and all donations are tax-deductible. For verification of this information, please contact us. For all donations we will send a letter of appreciation which will serve as your receipt. No goods or services are rendered directly as a result of your donation, so the full amount may be deducted. *About our 501(c)(13) status: When we applied for our 501(c)(3) non-profit status, the IRS required us to be listed under subsection (13) instead of (3) because of our affiliation with a cemetery. While we do not own the cemetery at this time, we still fall under this category. The only significant difference is that it allows for the accounting of additional types of contributions which are not tax-deductible (lot sales and direct charges for services) which we DO NOT accept or provide. The bottom line is that all donations to our general fund and veterans memorial fund ARE tax-deductible under IRS rules, in the same way as 501(c)(3) donations are.